My 2002 Trailblazer rear hatch won't lock. I can lock the doors with the inside buttons or with the remote but the rear hatch and rear window won't lock. I can open the hatch with no alarm but if I open the window the alarm goes off. I removed the inner cover from the rear hatch. When I open the hatch there is a clicking noise coming from the box shown in the photo, it clicks about every 3 seconds like it's trying to lock or unlock. It looks like the bracket to the window lock rod jumps every time the box clicks (if it's in the open position). If I move the window lock rod to the lock position it doesn't jump during the clicks. The black box in the photo is on the right side of the hatch looking from the inside. I don't know what it is... could this be the problem? What is this component called? That is the liftgate control module. 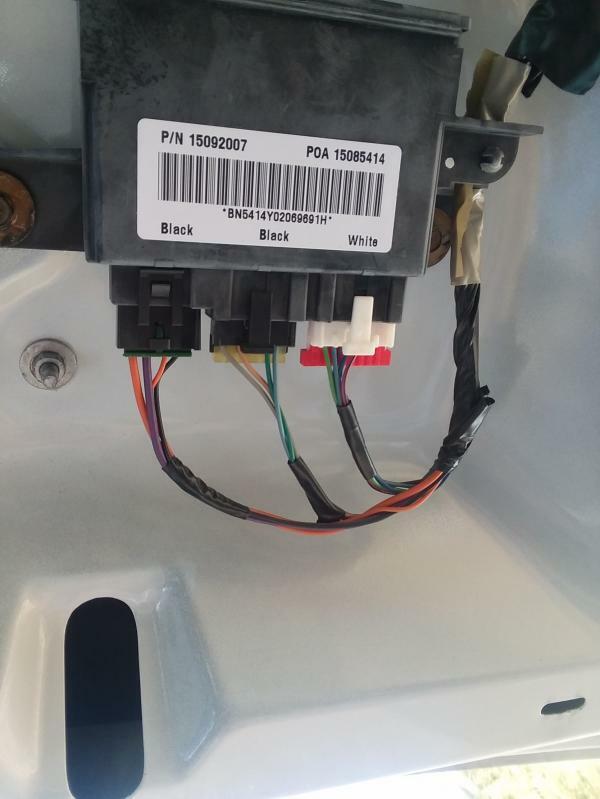 Before you start replacing electrical components take a look where the harness runs through the gate. I am self employed and do mostly used car-lot work and see this type of repair often. I did a quick search and found this type of damage common on trailblazers. Also found this example what it looks like. Thanks Junkman, I'll check the wiring to start. I checked all the wiring, it all looks good. Anybody have any other suggestions? Does power reach the lock mechanism motor when signaled? You'll need help or alligator clips to test at the door latch wiring. If you have a power probe, you can disconnect the latch and power cycle it. If power reaches the latch, then the internal gears are probably broken. I'm pretty sure power is getting to the lock mechanism because it clicks/jumps when the liftgate control module clicks but I'll check it with my multimeter. I don't have a power probe, will it do any good to power cycle the latch anyway? How do I power cycle it? I use my Power Probe IV to apply 12V to all kinds of components. I like to use it especially to test electric fans and a/c clutches. Once, I even used it to power a starter. If possible I remove components then apply full 12V to test operation. 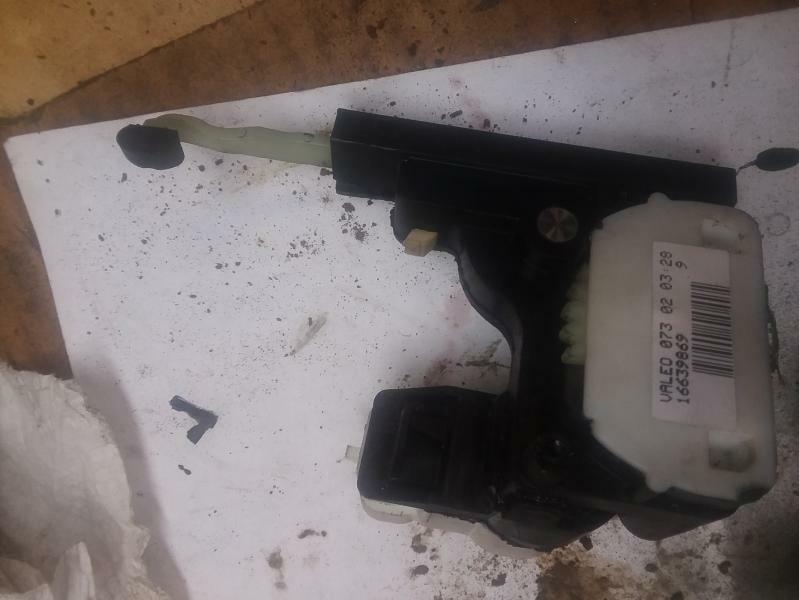 For door latches and window regulators, I test/feel for broken gears or plastic parts. Try using a little WD40 on the latch too. I use WD40 on my SUV rear latch. Helps to remove grime buildup and lube it. OH, yea. On testing the starter, I removed the relay. Using the Power Probe and relay diagram, I determined which wire/slot went down to the starter. Using the probe switch, I powered the starter. Since the starter worked, I moved to test ignition parts. Ended up replacing the key switch. Saved me a lot of time from swapping a starter. Same thing for windows. I pull switches, then power individual windows. If windows go up and down, the problem is likely the switch. Checking fuses is even faster. It makes different noises for power (12V) and ground. Lights turn off for both too. It's a great tool I saw a mechanic use on a truck I couldn't find a starting problem on. He found a bad fuse with a Power Probe III. Now, an adapter can be used to supply 5V. 5V is handy to test on other components like throttle position sensors. Great tool. They have I-IV. A hook. Now, a newer version coming soon. Did the door latch mechanism move freely? Yes, everything in the latch mechanism moved easily. There is a white shaft sticking out of the part shown with a small black plastic piece on the end that connects to the other part. When I moved this shaft back and forth nothing visibly happens, is that ok or is something supposed to move (like the gear)? Execution time: 0.079 seconds. Total Queries: 19 Zlib Compression is on.